Daisy is one lucky draft horse. On Wednesday, Russ Thiessen's children were out feeding their horses on their land outside Martensville, Sask. When Daisy didn't show up for her feed, the children started getting worried.Eventually, they found her. Somehow, the Daisy had backed into a well, leaving only her head and front hoofs sticking out of the ground. "It was like, this is so unreal. Is this actually possible?" Thiessen recalled. Thiessen frantically called neighbours, a tow truck and a local veterinarian. 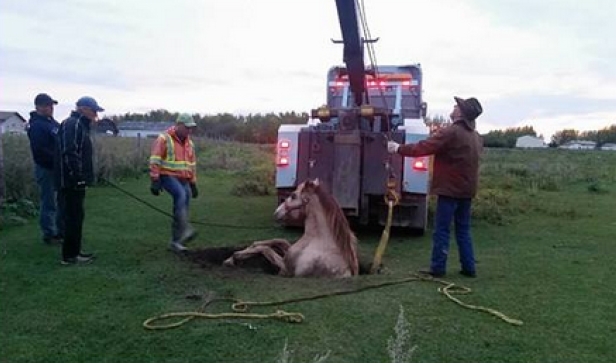 After two hours and a lot of lifting, the horse was safely extricated from the well. Dr. Jesse Vargo said Daisy seems to have made a full recovery. 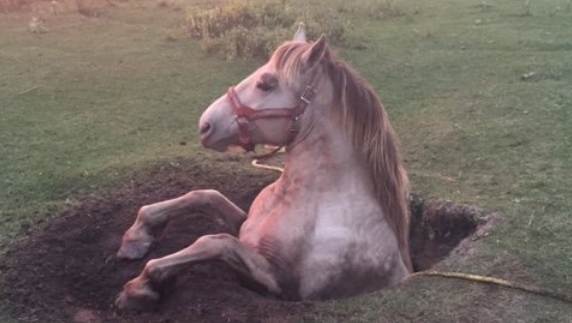 The veterinarian had been worried about internal injuries — the horse had been trapped in the hole for hours — but it appears Daisy suffered no serious harm. Figuring out how to safely pull the horse out of the well was challenging, Vargo said, adding he was glad Daisy remained relatively calm. "She wasn't sedated at all," he said. "We had just given her pain meds, because she was so calm. 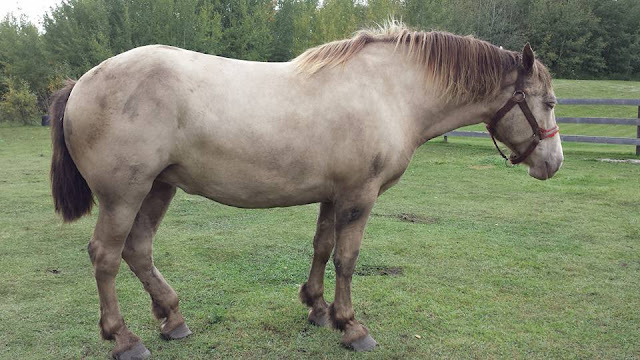 "The incident was nothing new for tow truck owner Brad Stratychuk, who said it was the third horse rescue he's seen in more than 30 years of operation. "We get some very strange calls," he said. "When the conservation officer called us to haul a moose out of the city, I thought that was pretty odd, too." Thiessen said he had no idea there was a well or homestead on the property. If everything goes well, Daisy will be able to return to her regular job, pulling local children around on sleigh rides when winter arrives. 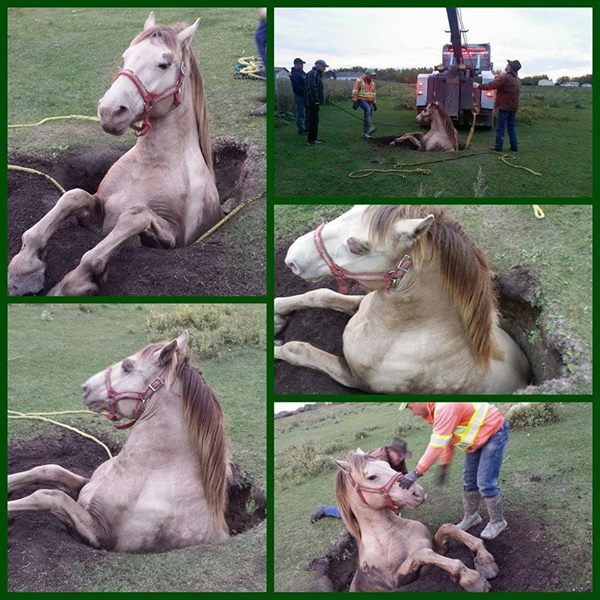 Thanks so much to Brad's Towing and to Corman Park Veterinary Services for being part of the team that assisted Daisy, our neighbours draft horse, in her traumatic rescue. Couldn't have done it without you. Was a long few hours, which felt like days to some, but everyone worked together and got her out. Before and after pictures in comments. Responses to "People Get Creative To Save Horse Stuck In A Well "
Get the poor old girl's back leg looked after, unless it has always been that way. And for the love of God, cover the well with metal plates , not wood that rots away. Come on people.